An ongoing concern for Miyazaki is the ridiculousness of machismo and patriarchal standards. In his stories, men are silly. They have codes of honor and ego — pride makes them lose all perspective. Miyazaki sees himself as a feminist, and he tends to have female protagonists. I wonder if a better description is gynocentric: Miyazaki’s world revolves around women. Even when guys are the main characters (as in Princess Mononoke and Castle In The Sky), women are the ones to be taken seriously. Pazu is the (ostensible) protagonist of Castle In The Sky. He’s an affable kid who, like many kids in anime, has his own house and takes care of himself because his parents are dead. He works as an assistant at the mines, tightening gaskets and making sure his boss is free enough to work with the miners. One night at work, he sees a girl come down from the sky. She floats with a bright blue medallion on her neck. Taking her home, Pazu befriends her and, of course, pays for his benevolence. Sheeta, the girl, is wanted by some bad actors — not just a pirate clan led by Dola, a giant woman, but shadowy government types — and it’s because of the stone. The legendary Laputians, who built the floating island of Laputa1, harnessed these levitating properties. When the government thugs, led by the mysterious Muska, get a-hold of Sheeta, Pazu joins forces with the pirates to rescue her and take her to the fabled island. 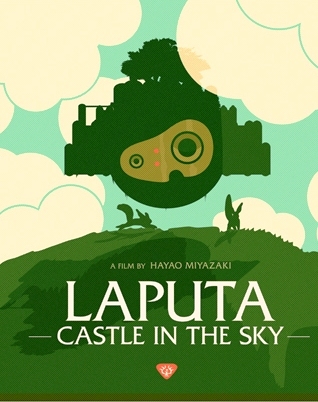 Castle In The Sky can be faulted for being more a Miyazaki pastiche than a wholly original work. The setting is vaguely pre-WWII European, the storyline and some scenes parallel aspects of Nausicaa and Cagliostro, and many of the designs (especially the cool-looking Laputa robots and the squirrel rat) are cribbed from his early work. But it’s done so well, and with such good nature, that it seems churlish to complain. Miyazaki’s concerns are similar to those in Nausicaa, but they’re not so pointed here. Laputa is technologically advanced, was used by rulers as a weapon to oppress countries with. In a way, it embodies Miyazaki’s weird, nostalgic anti-nostalgia. Everyone wants Laputa for something, and the city is beautiful, but that beauty is built on a past of cruelty and tyranny. The dead, defunct Laputa is better than a functioning city or treasure, and not to find it is probably best of all. Muska knows the past, and he wants to use it for its intended destructive purpose. This is an aggressive, male force, and a ridiculous one (in Miyazaki’s view). Aggressors and aggression are bizarre things in Miyazaki’s world. Women (never shrinking violets) are voices of reason. When Pazu’s boss confronts one of the pirates, it’s a baboonish display of literal chest puffing. The boss flexes, his shirt bursts, and his unimpressed wife says, “Who’s going to fix your shirt?” Moments before, she tricked Pazu into leaving the fray by saying Sheeta needed protection. With these elements, Miyazaki creates an unique sort of adventure — the adventure that negates its own purpose. In the end, finding Laputa is antithetical to the aims of the sympathetic characters. The masculine impulse, the adventuring impulse, is a waste of time, detrimental to friends and family. The point of Miyazaki’s adventures is to learn why you should just stay home. 1Laputa is the name of the floating city in Gulliver’s Travels. Puta, as any junior high Spanish student would know, is a curse word in Spanish. Jonathan Swift knew the Spanish connotation. Miyazaki, we presume, did not.